It may seem impetuous to uproot one’s life and move to a foreign country after only a single 10-day scouting trip. Even though Cuenca was a city my wife Cynthia and I had never heard of prior to discovering it through International Living, and Ecuador was a country we knew next to nothing about, we were confident that we were making the right decision. During the imploding economy of 2009, we realized that our best option was to retire early and move abroad. But before taking the bold step of relocating overseas we decided to make a checklist of the qualities and characteristics in our ideal location. • Proximity to our family in the U.S. 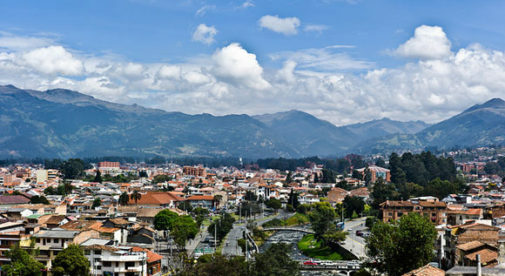 When we stumbled upon Cuenca, it amazingly appeared to meet all of our criteria. So much so that we booked an investigative trip immediately to confirm our expectations and reveal any potential deal breakers. Cuenca turned out to be even better than we hoped, and we’ve happily lived here since May 2010. In our time as expats we’ve climbed mountains, ridden horses, watched whales, hung out with Galapagos giant tortoises, and zip-lined over canyons. We’ve also gotten lost more times than we can remember, attended parties we weren’t invited to, and accidentally insulted strangers with our shaky Spanish. No matter how well you think you’ve prepared, life overseas is full of surprises. For instance, the amazing friendships we’ve developed have turned out to be one of the most important and meaningful aspects of our relocation abroad. Yet at the time we were creating our wish list, that thought never occurred to us. Our previous world was so consumed with work, commutes, chores, and errands, that having more friends didn’t enter our minds. After moving to Cuenca our social lives became such a whirlwind we were burning ourselves out. Now we limit ourselves to three outings a week. Three a week? In the States it was maybe three a year. Do you hope to someday live abroad? If so, I suggest that you develop your own checklist. A thorough self-examination of your likes and dislikes, family relationships, health, and financial status will help you zero in on the ideal locations for your future overseas life. Decide what you want. Move forward with confidence…and be ready for the surprises. Trust me…it’ll be worth it.